The history of modern Socially Responsible Investment began with the Apartheid crisis in South Africa in the 1970s. When asked if divestment played a role in ending South African Apartheid, Nelson Mandela answered "undoubtedly". But what about SRI in the 21st century, does it make a difference for society? 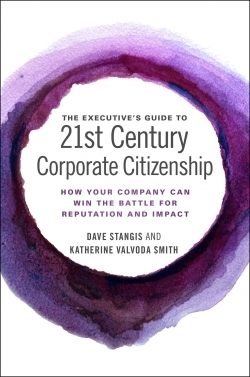 The first part of this book explores the innovative approach of socially responsible investors in building engagement approaches, mobilizing networks, developing new products, and proposing alternative models showing the potential to create change. 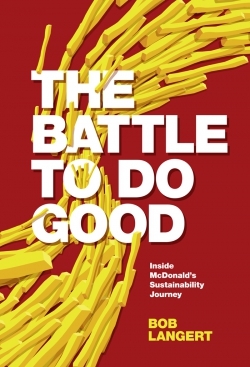 The second part interrogates the limits of SRI in making a difference. It questions the potential of SRI to create change but also proposes ways to increase societal impacts of SRI. 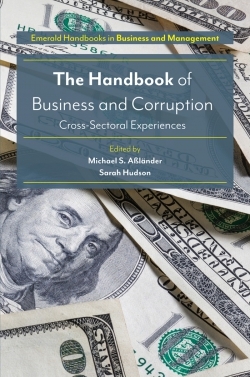 The last section of the volume addresses the boarder issues of values and governance and shows how they are central in the SRI discussion. 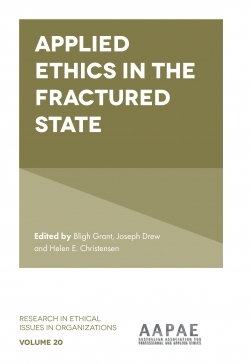 The book takes a critical but constructive stance on SRI with the objective of contributing to the capacity and ability of SRI to make a difference. Little research has been undertaken on the societal impacts of SRI. With this book we contribute to this debate, pushing the boundaries of SRI even further. 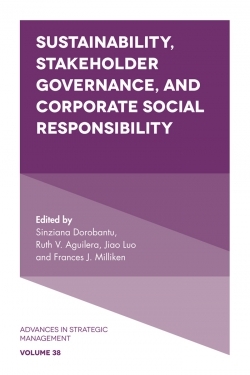 Mobilizing SRI through investor governance networks: The politics of collective investor action. Exploring the societal impacts of SRI. 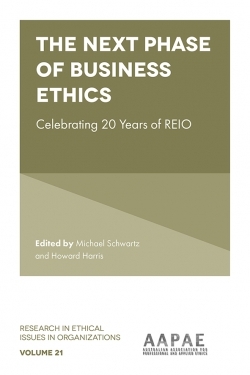 Shareholder engagement and Chevron’s policy 520 on human rights: The role played by the United States Jesuit conference’s “national Jesuit committee on investment responsibility”. Social innovation and investment: The ShoreBank experience. The emergence of impact investments: The case of microfinance. Where do-gooders meet bottom-liners: Disputes and resolutions surrounding socially responsible investment. 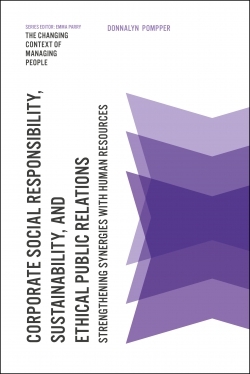 Increasing the effectiveness of SRI corporate engagement on climate change through a responsive regulation framework. Company–community agreements in the mining sector. 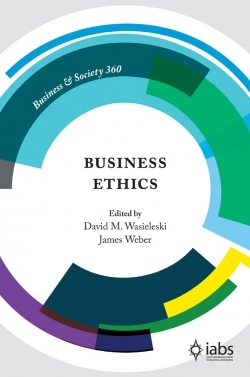 Ethics, politics, sustainability and the 21st century trustee. 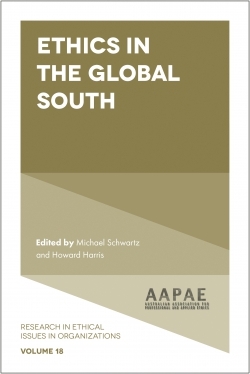 SRI in South Africa: A melting-pot of local and global influences. To govern and be governed: The governance dimensions of SRI’s influence. SRI in the 21st century: Does it make a difference to society?. About the Authors. Acknowledgements. About the Editors. List of Contributors. Editorial Advisory and Review Board. 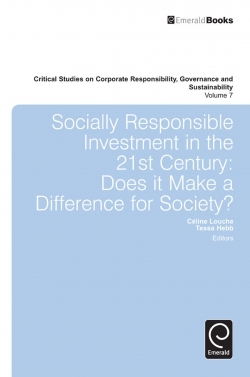 Socially responsible investment in the 21st century: Does it make a difference for society?. List of appendices. List of Figures. List of Tables. 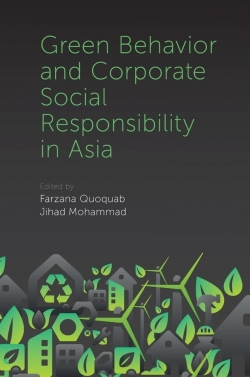 Critical Studies on Corporate Responsibility, Governance and Sustainability. 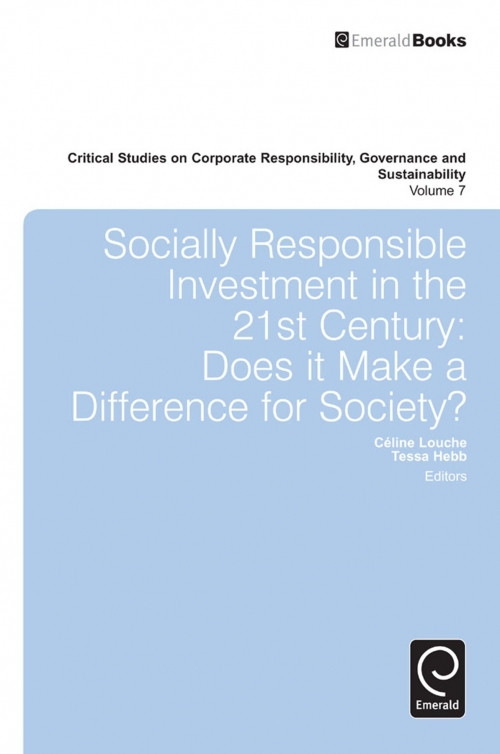 Socially responsible investment in the 21st century: Does it make a difference for society?. Copyright page.